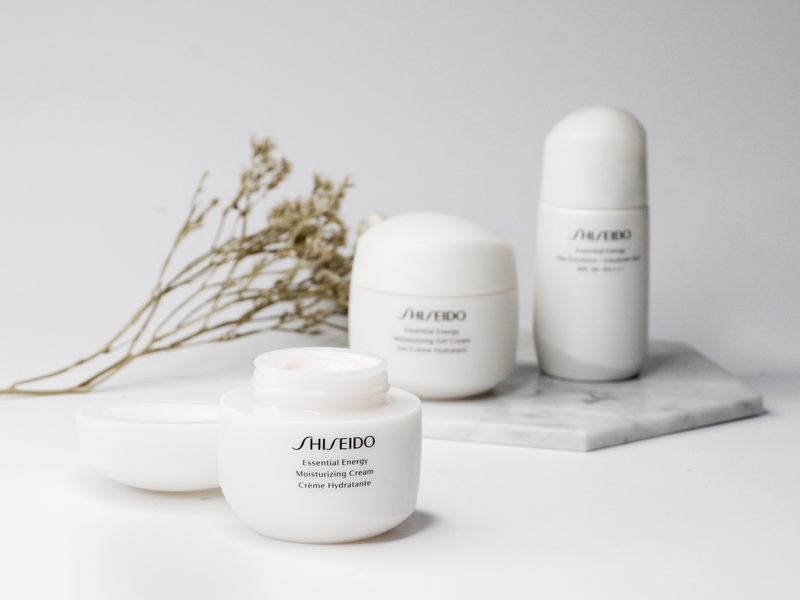 I’m back to talk about the neuroscience-inspired Shiseido Essential Energy skincare range, which should certainly pique your interest simply because, well, what has the brain gotta do with our skin?! That’s the question that was constantly on my mind anyway, especially when attending the press event in Tokyo. While there, and at the one in Singapore as well, I have to admit to being swayed by the promise of the Essential Energy collection. Just look at how cool their presentation is. Beautiful light installation aside, it has a lot to do with hearing how the skincare range is right on the cutting-edge of beauty science. Instead of merely focusing on the physical elements of our skin, it delves deeper to address our skin’s sensory system, and works to make it more responsive to the skincare products we’re using. Hence, the Shiseido Essential Energy skincare range. But my first thought was this: does tapping into our brains and nerves really do wonders for our skin? You’ll have to read on to find out. It’s for people who want their skincare to work. We’ve heard that skin in its 30s doesn’t recover as fast as before. Shiseido understands this and wishes to address the growing concern of women who continue to go for expensive skincare regimes or facials, and yet, find little lasting results. Essentially, your skincare regime seems less effective than before. They’ve therefore worked on technology that targets the skin’s sensors — how our skin detects and responds to its environment — in order to counter this issue. That said, the range isn’t just for a particular age group; it’s recommended for those who are seeing the first signs of ageing, or those whose skin looks dull and feels dry. It’s inspired by neuroscience — and works to enable our skin to be more responsive. The key here is a breakthrough Reneura Technology™ that focuses on our skin’s neuro-sensory functions, which then allows our skin to respond to the hydrating and nutrient-rich benefits of our moisturiser. The first idea is to trigger a response from the way the product is applied, by way of a flexible Active Responsive Powder. This works kind of like a massage; the ball-shaped powder flexes under our fingers, which allows our skin to feel the sensation of movement. Secondly, there’s the Ashitaba α Extract, from the native Japanese ashitaba plant that has strong regenerative powers. The extract serves to protect against skin damage, enabling our skin to be more responsive and effective in repairing harm from our external environment. It’s total aesthetic goals — and very thoughtful design. I mean,#topshelfgoals is actually a thing right? We 100% are going with the idea that beautiful packaging makes the average product instantly more desirable, and while that’s usually the case for makeup, it helps when a skincare range is on board too. The white, minimalist, marbled effect of the Shiseido bottles are obviously beautiful — you’ll want to carefully arrange them by your bedside. Then, there’s the thought that goes into them: the organic shapes are inspired by handcrafted Japanese tea bowls, and are designed to fit snug into your palms. Plus, there are 64 unique bottle shapes in total, with slight variations to the bottle or cap design, making each experience of holding the bottle a slightly different one. All this leads to this trio of moisturisers that aims to improve dullness, roughness, or the appearance of fine lines. Review — How Did It Feel, Does It Work? I have combination skin that’s more towards the dry side, so moisturisers are the one part of my routine that I absolutely do not skimp on. And that’s considering how lazy I am most of the time. At its most minimal, I put on some form of moisturiser in the day; at night, I tell myself that there’s at least a layer of moisturiser on my face so my skin can heal and get its much-needed hydration. So, it’s a relief that the Shiseido Essential Energy Moisturizing Cream fulfills my basic needs, and more. The first thing that hits you when you open the cap is the scent — and that’s a good thing. A fruity-floral scent with a key touch of sweet orange, it’s a pleasant fragrance that’s at once uplifting as well as soothing and calming. You know the feeling of walking into a spa and knowing that you’re about to be restfully pampered? That’s where this takes you. Of course, your skin’s about to be pampered as well. 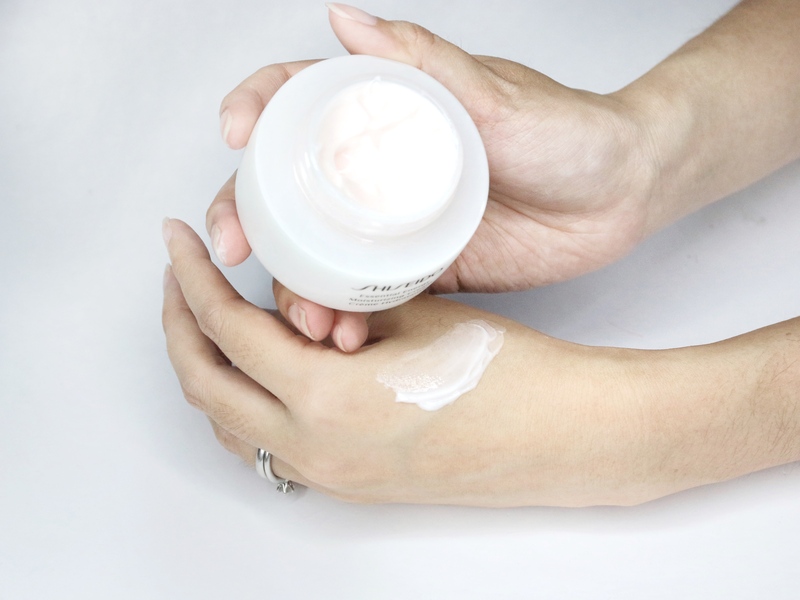 The cream has a velvety, whipped texture when you lift it off the jar, and when you place it onto your skin, it feels almost like a soft sigh. I like to apply this in circular motions, and that’s when you can feel the silky-smoothness of the product; despite its rich and slightly thicker feel (it’s not that lightweight), the moisturiser melts into your skin and simply disappears from sight, though leaving my skin feeling soft and supple. What I also like that is it feels intensely hydrating for my skin, and creates a nice plumping effect, but doesn’t sit on top of it uncomfortably. This helps a lot, especially before makeup, or before you sleep when don’t want the product transferring onto your pillow. I like to use it at night, as an intensive treat for my skin. And so far, my skin’s eager to slurp it all up — I start my day the next morning fresher, with my skin really feeling the difference. At times, when I feel my skin’s particularly dry (especially when I know it’s going to be a scorching hot day ahead), I’ll apply this before my makeup. That’s when I noticed that its hydrating effects last longer than usual, and my skin still feels nice and soft despite the sun and constant blast of air-con. 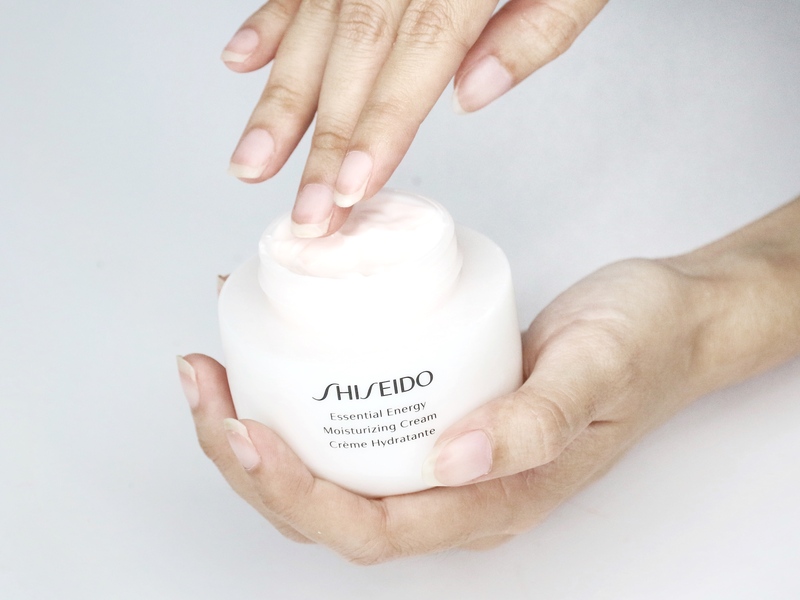 Another relief is that the radical technology discovered by Shiseido isn’t just confined into one type of product — they’ve got more than one moisturiser in the range, with different textures each, probably since they realise that people do have different preferences. Here, you can already see that the Essential Energy Moisturizing Gel Cream is a lot more lightweight than the previous cream, with a more transparent and watery texture. There’s a bounce to it too when you pick it up and spread it onto your skin. When I apply it, the gel feels immediately cooling, and instantly sinks into your skin, with it completely disappearing seconds after. Of course, there’s then no sticky residue after. I use this in the day, or when I feel like my skin’s a tad more oily than usual — the light texture helps balance it out so my skin never feels uncomfortable. If you’re living in a tropical climate, have skin that’s less dry, or just prefer light formulas, this is absolutely the one to go for. Those with younger skin will fall in love with the texture in no time. One word: SPF. You already know how important sunscreen is (we hope you do), which is why we need all the help we can get when protecting our skin against UV rays — it’s just being smart, you’ll see less dark spots and blemishes, while your skin will retain its youth for longer. So it makes total sense that Shiseido has incorporated that into the Essential Energy Day Emulsion. The texture of this moisturiser’s the most liquid of the lot, and it flows onto your palms when you tilt the jar. To be honest, I’m not a fan of the way it’s being dispensed, and I’d much rather it be a pump or a squeeze tube so I’ll have more control of the amount that I’d like to use. Still, I’m swayed by the suncare benefits, and how the formula still leaves my skin hydrated for a long while, even throughout the day. 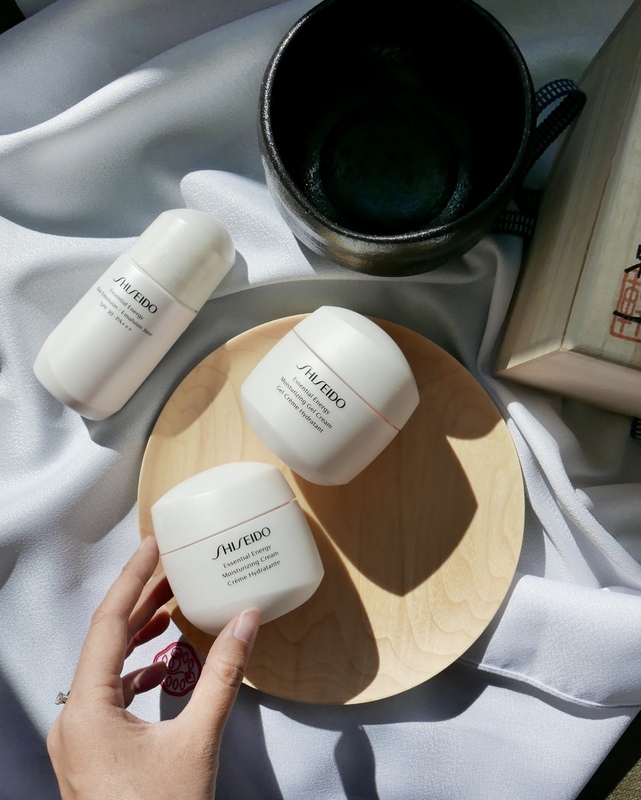 Overall, I’m impressed by the long-lasting hydrating benefits of the Shiseido Essential Energy range, and how they’ve come up with three different formulas that you can customise based on how your skin’s feeling at the moment, or your personal preference. I’ve been rotating between this trio for two weeks now depending on my skin’s mood, and I do like that versatility. The care that goes into each texture can definitely be felt, quite literally too — each one goes on silky and smooth, and melts into my skin with impressive immediate results. That faint calming scent you’re left with feels just as luxurious. Over time, I’ve noticed that my skin looks brighter and less dull, especially when it came to old blemish spots. More bouncy and supple too. The last week happened to be a bad one for my skin (I blame the hormones). It also didn’t help that I was obsessed over this particular blemish and made it flare up even worse. While using Shiseido’s range though, I’ve noticed that the unsightly patch of skin healed a lot faster than it would with my normal skincare routine. Oh yes, I’m 28, so already kind of feeling the effects of how my skin takes more time to recover — I’m glad to see positive results here!